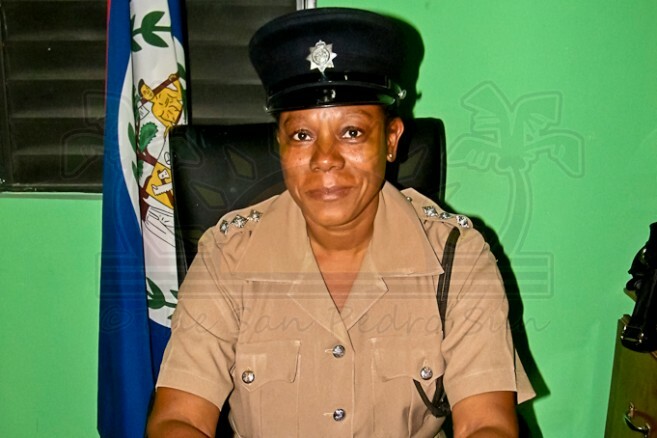 For weeks it has been widely rumored within the Belize Police Department that the Officer Commanding San Pedro Police Station Assistant Superintendent of Police Viennie Robinson would be transferred before the 2013 Easter Holiday. It has now been confirmed that her transfer is imminent and that in fact, will be done even before completing a year at the helm of the San Pedro Police force. The confirmation was made by her direct superior, Commander of the Eastern Division Police Formation responsible for San Pedro, Assistant Commissioner of Police, Elodio Aragon Jr.
Aragon made the confirmation during the regular Monday Police Press Conference on December 10th. “When it comes to Mrs. Viennie Robinson, the officer commanding San Pedro, she has been slated for transfer and I think presently that is being looked at for January. If I am not mistaken it is for the 15th of January of next year for her to be transferred to Belize City, and at that point in time, a replacement will be sent out to San Pedro. That has been in the plan already,” said Aragon. There has been no official reason given for her transfer, but it has been public knowledge that Robinson’s by-the-book approach to the law was not well received by residents who had enjoyed a more liberal policing approach. Robinson and Commissioner of Police David Henderson also had differences dating back to Good Friday of 2012, when she was asked to allow the sale of alcohol and she refused, quoting the Belize laws that prohibit the sale of alcohol during the said day. In addition, on the 11th of August, Robinson and Henderson had yet another disagreement over the arrest of 19-year-old Sylvia Teul (said to be the girlfriend of the nephew of the Commissioner) who was detained and denied police bail after she allegedly assaulted a female special constable inside the San Pedro Police Station. While Robinson declined to officially comment on the issue, The San Pedro Sun understands Henderson has sent a request for Robinson’s transfer to the Public Service Commission with the support of Area Representative Manuel Heredia Jr. The San Pedro Sun understands that Robinson will be transfer to a “desk” position at the Traffic Department of the Belize Police Formation, while Assistant Superintendent of Police Chris Noble will be taking over the San Pedro Police Formation. Robinson, respected by many within the Police Department as a “no nonsense officer,” took over the helm on the San Pedro Police Formation on the 13th of March of 2012. She became the first female to lead the SP Police Formation but also becomes the first Commanding Officer to serve the least time in such position.Robinson has been with the Police Department for over 28 years and in 2010 received a long service medal for her outstanding and dedication in her career. ASP Robinson is scheduled for retirement in four years.